These are the proceedings of the twenty-third in the series of international workshops associated with the Solar and Heliospheric Observatory (SOHO) mission. This workshop brought together more than 95 scientists with a broad range of interests and expertise to focus on the topic of the unusual minimum of the Sun's activity cycle that persisted in 2007, 2008, and 2009. The meeting attempted to arrive at a better understanding of why this minimum appeared to differ from other solar minima observed during the space age, and it also explored similarities and differences with minima from earlier periods. The issue of whether or not the Sun is entering a new "grand minimum" of activity (comparable to the historical Dalton and Maunder minima) was a topic of vivid discussion. 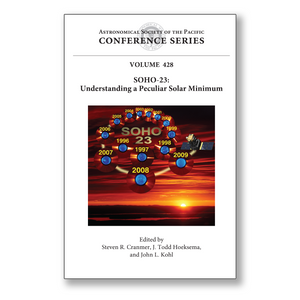 The SOHO-23 workshop addressed the following topics: (1) the role of the solar interior in determining solar minimum characteristics, (2) manifestations of the unusual solar minimum in the photosphere and chromosphere, (3) the time-variable corona and the current solar minimum, (4) how the solar wind transmits the unique properties of solar minimum to the heliosphere, and (5) solar cycle history and prediction. There were 20 invited review talks, 28 contributed talks, and 44 poster papers presented on these topics. This book is of interest for researchers and graduate students interested in solar physics and related fields such as astrophysics, space plasma physics, and laboratory plasma physics.